Thank you! An email as been sent to our sales department and we will get back to you as soon as possible. The Klein K-8 is the ultimate colorimeter for measuring flicker on small displays. It has a ±20 degree acceptance angle, and a 4mm measurement area that is critical for measuring these types of displays. The smallest and most portable Klein device, the K-8 is the instrument of choice for quality control and manufacturing applications. Like all Klein colorimeters, the K-8 is ruggedly constructed with machined aluminum and high impact plastic. The K-8’s auto ranging is solid state, and the housing is impact resistant to hold up to the 24 hours a day, 7 days a week usage that display manufacturers require. The K-8’s compact size and light weight make transportation convenient. 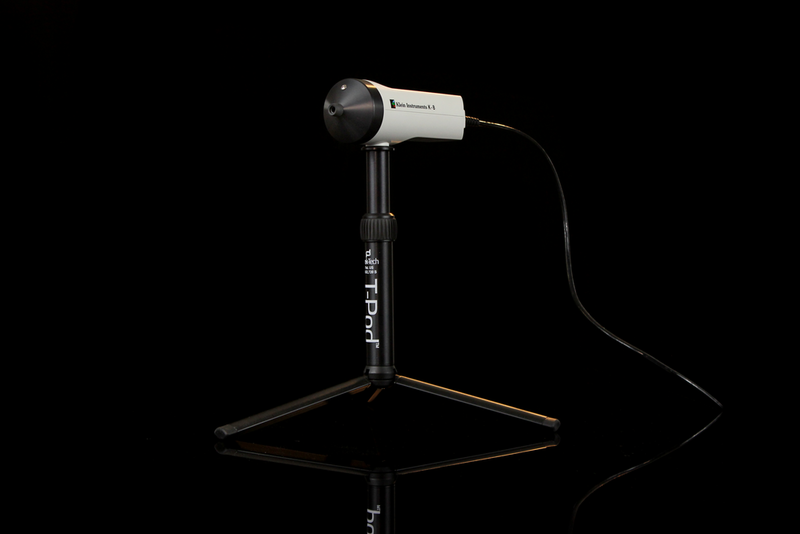 It is also fitted with a universal tripod mount for easy positioning and integration into workflows. For maximum accuracy, not only is the f1’ of Y critical, but the accuracy of X and Z as well. Each diode has specially layered absorption filters designed for maximum color accuracy. Klein colorimeters are also rigorously tested to ensure that each device is thermally stable with an operating temperature range of 15-35 C.
The Klein K-8 also functions as an FFT (Fast Fourier Transform) flicker meter. The probe measures and integrates Y data in the head, streams in real time to the PC, and then the FFT is performed. The Klein K-8 can measure regular flicker between 1-150Hz. Multiple methods for displaying flicker data including JEITA, VESA, and contrast methods are selectable in the software. 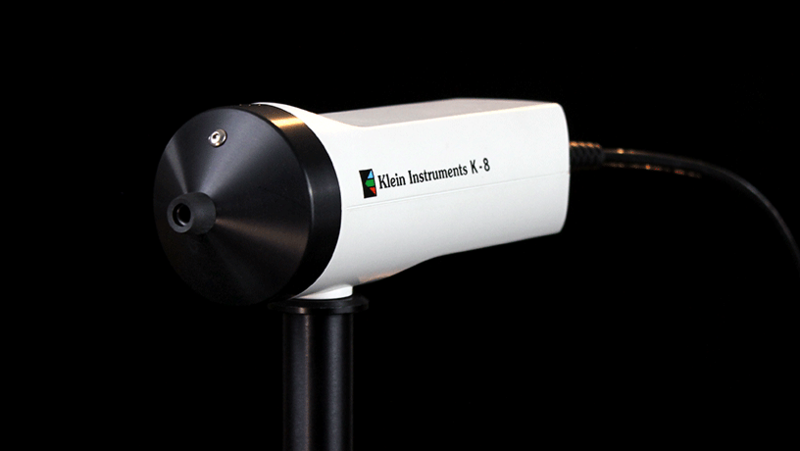 The Klein K-8 can be used to analyze any luminance source, including the common refresh-rate flicker in monitors, and random flashes caused by the transmission of current variations through solid state devices (LEDs). All flicker information can be logged and reported with Klein Chromasurf.